Researchers at Nagoya Institute of Technology have established a reaction catalyzed by Bis(imidazoline)/zinc whereby 2H-azirines react with phosphite, yielding aziridines at a high enantiomeric ratio. Given the value of existing aziridines as chemical building blocks as well as medications such as the chemotherapy agent mitomycin C and the antibiotics azicemicins, this reaction system could provide a range of new targets with pharmaceutical potential. Chemists at Nagoya Institute of Technology have developed an innovative chemical reaction system, which could have applications for developing starter molecules for additional synthetic procedures in organic chemistry, as well as pharmaceutical candidates with a potentially wide range of biological activities. Given their three-dimensional nature, many chemical compounds can exist in two different forms that are mirror images of each other, called enantiomers. These can have markedly different effects on the human body, so it is often necessary to isolate only one of the forms prior to administration. To avoid this problem, it is possible to develop chemical synthesis methods that produce mostly or exclusively one of the possible enantiomers. 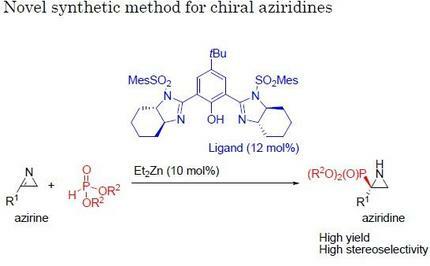 This is a salient issue for a class of molecule called aziridines, which include important antibiotics and chemotherapeutic agents, but there still remains substantial scope for manipulating and modifying the reactions by which they are synthesized for a range of applications. In a new study a team of researchers at Nagoya Institute of Technology (NIT) have established a new reaction whereby a group of molecules called 2H-azirines react with phosphite with the help of a catalyst. 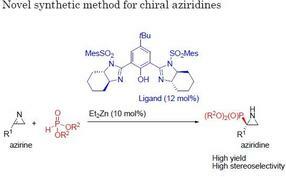 By applying a variety of catalysts and conditions to this reaction, they managed to produce aziridines at high yield and with a single enantiomer comprising as much as 98% of the total product. Little previous work has focused on trying to produce a high level of a single enantiomer from reactions with 2H-azirines because these compounds are not very reactive. Here, the researchers chose to employ a phosphite, comprising phosphor and oxygen atoms, for the reaction with the 2H-azirines because of its ability to contribute or donate electrons in this reaction, promoting the transformation of azirines to aziridines. "In the reaction of 2H-azirines with phosphite, we applied various chiral catalysts to see their effects," says Daiki Hayama of the Graduate School of Engineering, NIT. "Once we identified a catalyst that gave both a good overall yield and a high proportion of a single enantiomer in the reaction, we then focused on also optimizing the reaction conditions." Once a particularly effective combination of conditions was identified, the team also tested structural variations of the azirine used as starting material in the reaction along with the best catalyst found in the previous experiment, again achieving high yields and high rates of production of one of the possible enantiomers. "Our results show that this reaction is very enantioselective and works well for a wide range of azirines," Prof. Shuichi Nakamura says. "This approach should be very useful for developing new chiral molecules potentially with interesting features, both for medical applications and for further work in the field of organic chemistry."